Masculinity and sexuality are not the same thing. That quote, found about halfway down in this article about the camp, is from a a psychotherapist and early childhood specialist. Let that sink in for a moment. That quote is from an early childhood specialist who clearly does not understand the needs of boys. As described in the article, the camp “began in January after parents asked Tucker if he could develop a boys’ equivalent to the after-school programs they had for girls — like yoga and Girls on the Run.” Boys at the camp discuss and explore responsibility. (A common chant: “We do what we HAVE to do before we do what we WANT to do!”) They examine gender stereotypes and work on developing self-awareness. The camp includes physical activity, discussion and time to reflect. And this is controversial?? “Ridiculous,” to some? Boys deal with cultural expectations of males from the time are they are born. (Seriously — there are psychological studies which show how boy babies and girl babies are treated differently by parents and others.) Our boys grow up surrounded by all kinds of messages about what boys and men should and should not do. And boys are wired to look to other males for guidance on the important question of how to be a man. Creating spaces and opportunities for boys as young as 8 to wrestle with these questions, under the guidance and supervision of adult males, is a good thing. Bravo, Nick Tucker! 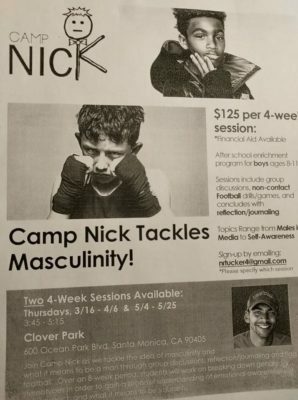 Would you send your son to a masculinity camp? Why or why not?